Leo Vegas mobile has taken out multiple awards including the title of Mobile Casino Product of the Year in the 2014 EGR Innovation Awards, helping secure its reputation as one of the world’s leading mobile vendors. But what makes it so special? The mobile site is nothing short of excellent, from the design, to the ease of play, to the extensive game variety, and essentially is as great as a casino app – just accessible through your Web browser, and without any need to download anything. Leo Vegas is a browser based site, which means that regardless of the smartphone or tablet model you’re using you should have no problem accessing the games as long as you have relevant software updated on your device. On top of all that, Leo Vegas offers some of the best casino promotions going around, from a matched deposit welcome bonus with a side of free spins, to ongoing promos which award cash and real world prizes with new offers available by the week. 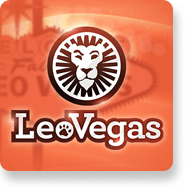 Follow our links to play at Leo Vegas and see why this site claims to be the “world’s fastest and most user friendly mobile casino”. Slots – Starburst, Twin Spin, Nirvana, Flowers, The Invisible Man, Rage to Riches, Fruit Shop, Neon Staxx, Steam Tower, Aliens, Blood Suckers, Dazzle Me, Bridesmaids, Dracula, Electric Sam. Progressive jackpot slots – Mega Moolah, Mega Fortune, Mega Fortune Dreams, Major Millions, Greedy Goblins, Rango, Mega Moolah Isis, Bell of Fortune, Speed Cash, Gift Shop. Table games – American Blackjack, Baccarat Star, Baccpo, Beat the Croupier, Single Deck Blackjack, Casino Hold’em, European Roulette, Imperial 7’s, Multi-Hand Blackjack, Pai Gow Poker. Mobile live dealer games – Auto Roulette Live, Baccarat Live, Blackjack Live, Casino Hold’em Live, German Live Roulette, Immersive Roulette Live, Ra Roulette, London Roulette Live. All of the above mentioned games can be played for free in demo mode, except for live dealer games which require real money bets in order to play. The browser based mobile site will work well on any mobile device supported by updated versions of Flash, HTML5 and Java. An active Internet connection is required to play real money games, so you’ll also need to make sure your mobile device is connected either via Wi-Fi, 3G or 4G. Not sure if Leo Vegas mobile will work on your phone or tablet? If you’re reading this on your mobile device simply click our links to head directly to the secure mobile site and check for yourself. Leo Vegas has a solid reputation in the mobile gaming industry, which is something we always look for before recommending an online casino to our readers. The site was first developed in Sweden but now operates out of Malta, receiving its licensing from the industry leading Malta Gaming Authority. Leo Vegas is now the biggest mobile casino in Europe, protecting players with a 2048 Bit SSL security encryption certificate which secures all personal information sent on both mobile and desktop. If you have any queries, comments or questions, Leo Vegas mobile is backed by a full customer support team. If you can’t find the answer you’re looking for under the FAQ section simply click on the support tab to start an instant chat thread, send a direct email message or find the relevant phone number for your country of residence.